On Christmas Eve when we went over to Lily's, Magnolia came running to greet us, as she does and the first thing she said was, "Where August? Where baby?" And today, when I met Jessie and August and Levon at Costco, the first thing August asked me was, "Maggie go?" At least Levon didn't ask for anyone else. I love how these two-year old cousins really are quite fond of each other, even if they are so very different. Maggie is determined to kiss and hug August and August is wary of this. If you haven't seen Maggie in fifteen minutes she'll run to you, calling your name as if you are her most cherished beloved whom she hasn't seen in a quarter of a century and want you to pick her up and she will pat you on the back with her pudgy little baby doll hands and smile and smile and smile. August, on the other hand, will grudgingly offer his cheek for a kiss IF he is in the mood and if he is not, he will pretend he did not hear you ask for one. But how can you not want to kiss that little lion? When I saw him I said, "Oh! It's not a boy! It's a lion!" and when I took his picture and showed it to him he said, "Not a boy. A lion." And we played that game in Costco. "Oh, Mr. Lion, please do not bite me!" I would say and he would pull his hood off his head and smile at me and I would say, "Oh! You are not a lion! You are my boy!" I got a sudden serious craving for Japanica! 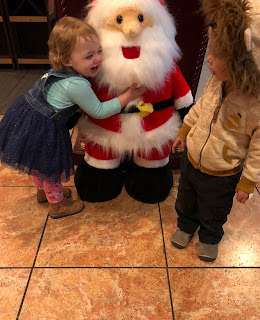 today and so after we were done at Costco and Jessie had changed Levon's entire wardrobe due to a major poop and then nursed him a bit, we met up with Lily and her three, and Mr. Moon too to eat some delicious miso soup and salad with ginger dressing and whatever else it was we wanted. Here are Magnolia and August. And that just about sums it up. Maggie hugging Santa with all of her might, burying her face in his beard and August standing there with a look on his face like, "What is wrong with this child?" Oh, my god. I love them both so much that it almost kills me. We all got our favorite foods and of course I got the curried tofu Bento box because that's what I always get and August helped me eat my salad and sushi and Owen tried my rice which he did not like (he only likes rice when it's in sushi) and my tofu, which he did like. Levon got passed around and at one point, Boppy was holding him and trying to eat with chopsticks with his right hand even though he is left-handed, and even when Levon fell asleep, he didn't really want to let him go. And after all of that, Lily and I met up at Publix and Owen helped me by pushing my cart and he did a great job. We had a strange moment by the yogurt when Owen started coughing. He hasn't been sick but he did cough and an older woman (meaning about my age) standing about ten feet away said, "Jesus!" and made a motion as if she were pushing away germs. "I heard that," Owen said to me with big eyes. "That was rude," I told him. "You did nothing wrong." His feelings were hurt though. And of course I love him so much that it almost kills me and I could have knocked that old woman (meaning about my age) into the yogurt case and been happy to do it. I restrained myself and merely hugged my boy and shot a glance at the aged biddy (meaning about my age) that told her exactly how I felt. We all survived and it's chilly and it's drizzling and I hope that tomorrow isn't too nasty and I hope that Owen isn't getting sick because I have planned to take Owen and Gibson down to the Gulf Specimen Marine Lab and aquarium tomorrow. I was just going to take the two of them for a sort of Mer-Boy date but others may go with us. We will get lunch and look at the "nursing sharks" as Owen said today, remembering our last visit, as well as the rays and the sea cucumbers and the rescued turtles being rehabilitated. I love this funky little place and it does such good work in the areas of education and efforts to protect our mother which is the sea, and the life within it. Well, we shall see what happens tomorrow. These camellias have started blooming and I am in glory-love with them. I picked those this evening in the rain and their color and their delicacy knock me out and I've put them in a little cruet and set them on the hallway altar table with the other camellias I've picked lately and every time I walk by it I feel as if I have the most beautiful works of art imaginable, right there for my own selfish pleasure. Drip, drip, drip says the rain. Bubble, bubble, bubble say the pinto beans. And I rise! says the bread. That coat! Could he get any cuter? That picture needs to be posted on Cuteoverload.com. Magnolia too. What a beautiful little cherub. Those camellias are breathtakingly beautiful. Long ago I applied for a job at the Gulf Specimen Marine Lab. Didn't get it, though. Take pictures if you can, please. It is my observation that the US is a country full of germophobes. Maybe she knows how ineffective the flu shot is for older people... You could teach Owen to cough into his arm to avoid it happening again, but I agree she was rude and he did nothing wrong. Tch. 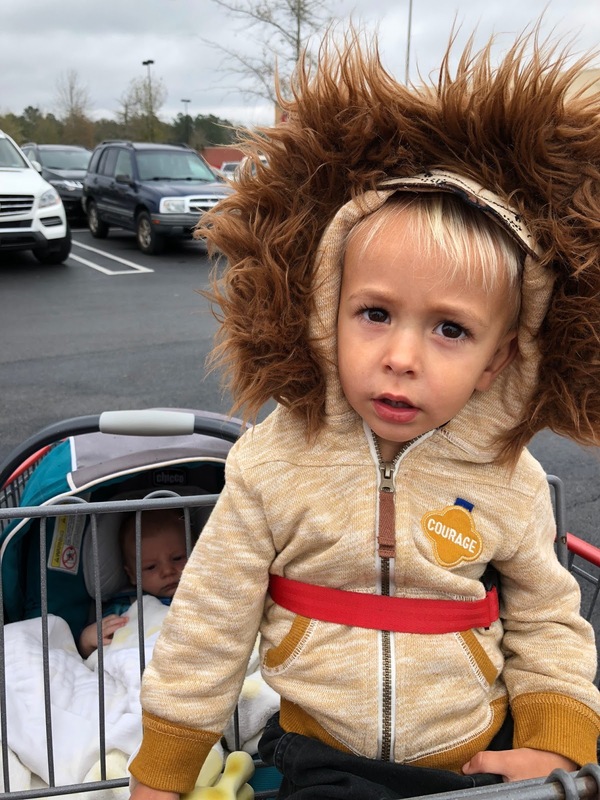 Apsrt from that, Lions and Camelias and Babies, oh my! I'm not surprised you had a Japanica! craving after all the Christmas fare. my youngest grandgirl was like Maggie, a very kissy baby. she grew out of it though and became a teenager who would barely tolerate hugs much less kisses. 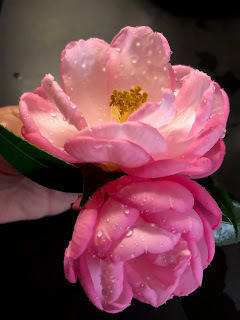 I've been seeing the pictures of your camellias for years and this year I am determined to try to grow one again. That WAS rude. What is wrong with people? I had a woman say a rude thing about me, within earshot, at the Tower of London yesterday. I turned and gave her a reasoned retort and she looked embarrassed. I was proud of myself. 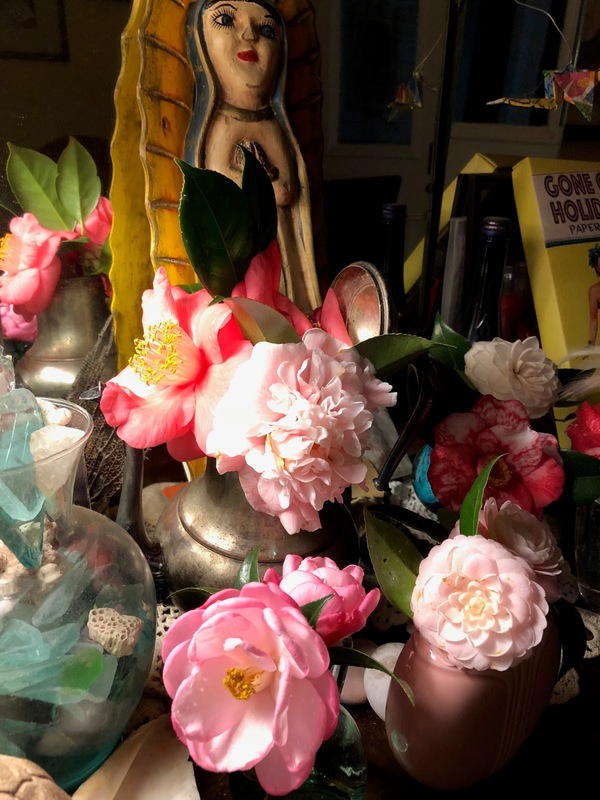 The camellias are beautiful, and the lion is fierce! !